In addition to our extensive line of precast concrete products, Shea Concrete also produces Column Wraps, Covers, and Sonar Tubes. We are continuously developing new products and expanding their availability to meet the needs and requests of our customers. So whatever your challenge or project, we’re confident we have the ideal solution. Shea concrete’s extensive precast product line gives you a leg up on just about any outdoor (or indoor) concrete project imaginable. 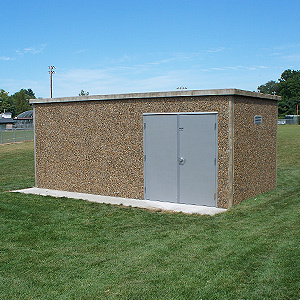 Whether you’re searching for precast concrete buildings, or finding the right concrete cover for your well, we have your solution. Shea Concrete manufactures many popular products such as precast steps and retaining walls, but we also offer miscellaneous precast items as well. For anything precast concrete, Shea Concrete Products is New England’s answer. Give us a call today at 800-696-SHEA. Our precast concrete frost posts, also known as our precast concrete deck footings, are one of the key ingredients to every successful deck construction project. Shea Concrete Products ensures its frost posts make the job of installing decks much easier because they are simple to use and endure the toughest of winter conditions. No more mixing and transporting concrete on the job site -- just place the precast frost posts in the hole, level the top, and backfill! The top surface includes a built-in threaded insert for setting and can also be used to receive your post hardware. Unlike the poured-in-place option, you don’t need to wait for setting and curing of concrete. Two types are available -- the 8” square top surface or the 16” square top surface. Both types are available in 4ft and 5ft heights. Shea Concrete’s precast frost posts include an integrated spread footing or base (ready-made combination deck footing and deck pillar all in one). The base should be situated below the frost line of the local area. The wide base also provides increased weight bearing support. Refer to our drawings for bearing support specifics. Our precast concrete frost posts are not just for decks; the posts can be utilized for any gate, stand, or mail box. Call Shea Concrete Products at (800) 696-SHEA if you’re interested in our concrete frost posts. Our precast concrete fire cisterns are reliable water sources for fire fighting, often required when municipal water supply is not available in the area. Shea Concrete Products offers many different capacities, sizes and layouts. A precast concrete fire cistern can be manufactured as a single tank or multiple tanks. Our cisterns are rated for AASHTO HS20-44 loading. The weight of the tank usually requires an on-site crane for setting. A complete piping package is available for our precast concrete fire cisterns. Our standard package includes: Fill line 4” steel pipe with a 2 ½” hose connection and suction line to be an 8” steel pipe with an 8” to 6” reducing elbow to a 4” to 6” dry hydrant connection. The suction line is connected to a 4’ square steel anti-vortex plate. The vent is 8” Sch40 PVC candy cane with bug screen. We also offer an optional water level float gauge with viewing glass to externally monitor water level in fire cistern. Manhole risers with bolt down covers for security are provided for tank access. Precast concrete cisterns are your only choice in high water table conditions. 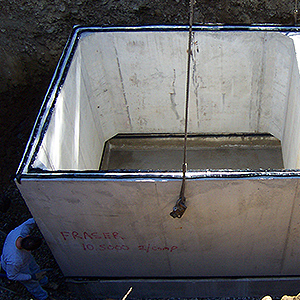 Concrete tanks can be designed for buoyant forces without the need of tie downs. Give Shea Concrete Products a call at (800) 696-SHEA if you’re interested in our lasting precast concrete fire cisterns. Shea’s concrete bollards provide commercial, municipal, and other public locations with a useful and decorative touch. Our precast concrete bollards can be used for additional perimeter security, or bordering walkways, sidewalks or parking spaces. We offer concrete bollards in colors of yellow, red, blue, light granite, or dark granite. Call our precast concrete bollard specialists today at (800) 696-SHEA for a complete rundown of shapes, sizes, and styles.